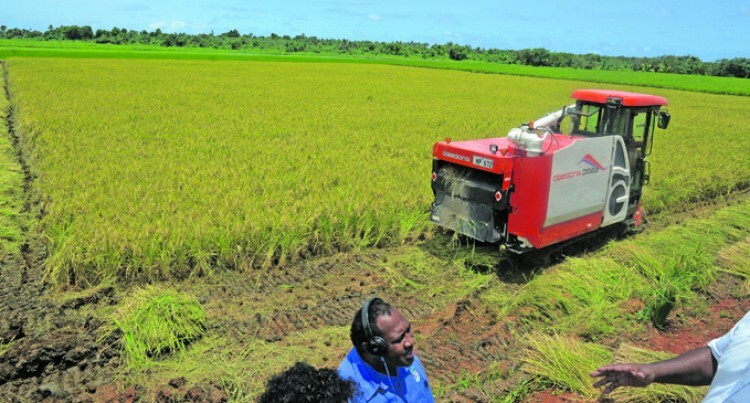 A combined harvester harvesting rice at Grace Road Food’s farm in Deuba. According to the latest estimate, there are still nearly half a billion hungry and undernourished people living in this vast region of Asia and the Pacific. Some 490 million people, each one lacking in the daily nutrients she or he needs to lead a healthy and productive life. This region had been making great progress during the 1990s and 2000s in fighting under-nutrition,but we now see that the fight against hunger has slowed in recent years and in some cases actually reversed. That’s bad news for us all, because the governments of this world had pledged to wipe out hunger, in all its forms, by 2030. In other words, in a little more than 12 years from now, there should be no more people in this world suffering from hunger and under-nutrition. In reality, that’s 152 months from now (give or take) or around 4,560 days to get the job done. As an economist, I like to do the math(s). By my own estimate, that means we must lift 107,456 people out of hunger each day in Asia and the Pacific. So 107K today, 107K tomorrow, and so on, week after week, month after month, year upon year. Of course, we must do this against a backdrop of limited natural resources, climate change, shifting and aging populations, urbanization, and amid hotspots of conflict, natural disasters and humanitarian crises that confound our efforts. With greater demand for protein-rich foods, we can see this as one factor in helping to defeat hunger, though in some places it is leading to obesity, which must be tackled simultaneously. After all, the challenge is to esure all people are getting access to affordable, nutritious foods at all times. But when you look at those hard numbers, and the challenges before us, it is depressing, yes. But no one’s ready to throw in the towel – in fact, just the opposite. The good news is that governments across this region are very aware of these challenges – and they aren’t giving up either. In fact, they have just now reaffirmed their pledge to go the distance and eradicate hunger in all its forms from their lands. Just last week, government ministers and senior officials from 40 countries across this region came together in Fiji to provide strategic direction and set priorities for FAO to tackle these issues going forward. It was the first time in more than two decades that such an event – the Regional Conference for Asia and the Pacific (APRC) – had been convened in the Pacific. What I found striking was the passion and intensity of the discussions and sharing of ideas. There was a clear edge to the talks – the effects of climate change on food and agriculture were now being seen and felt. While the delegates talked, a Category 3 Cyclone battered the conference venue – as if to remind them of the urgency of the tasks at hand. The countries called upon FAO to further assist them in strengthening their sector-specific contributions and help them monitor progress toward meeting the 2030 Sustainable Development Goals. They also wanted further support to integrate agriculture into their national policies, strategies and programmes for climate change and disaster risk reduction management. To meet these SDG goals, and as part of their Nationally Determined Contributions, countries have highlighted improved and more resilient crops, more efficient irrigation, improved animal and fisheries management, enhanced fertilizers, low emission rice and sustainable forest management as measures to be adopted and implemented. FAO is supporting governments to scale-up climate action for food and agriculture under the 2030 Agenda by mobilizing finance and expertise at the field level and advocating at the policy level for a more prominent role for food and agriculture in the global climate change agenda. But climate change is not the only worry.The countriesacknowledged that food systems need to be addressed to tackle growing rates of obesity, particularly in the Pacific where it is reaching epidemic proportions. A great note of concern was also evident over persistent hunger, as in some parts of Asia the number of hungry people was on the rise again, after decades of reductions. Civil society organizations participating reminded governments that decisions made in meetings like these must be inclusive – the end result must be in the interests of everyone, particularly the most disadvantaged and food insecure. Adapting agriculture to climate change, improving nutrition for all and eradicating hunger in all its forms will take teamwork. That teamwork was evident at the APRC. Together, FAO, its member countries and partners, can score the winning goal – the zero hunger goal – and we’ll do so within the time allowed, because we know we can.